If you’re planning on supporting the Swans on their 2018 pre-season tour of Austria and Germany, then here are all the details you will need to make your European Tour as enjoyable as possible. 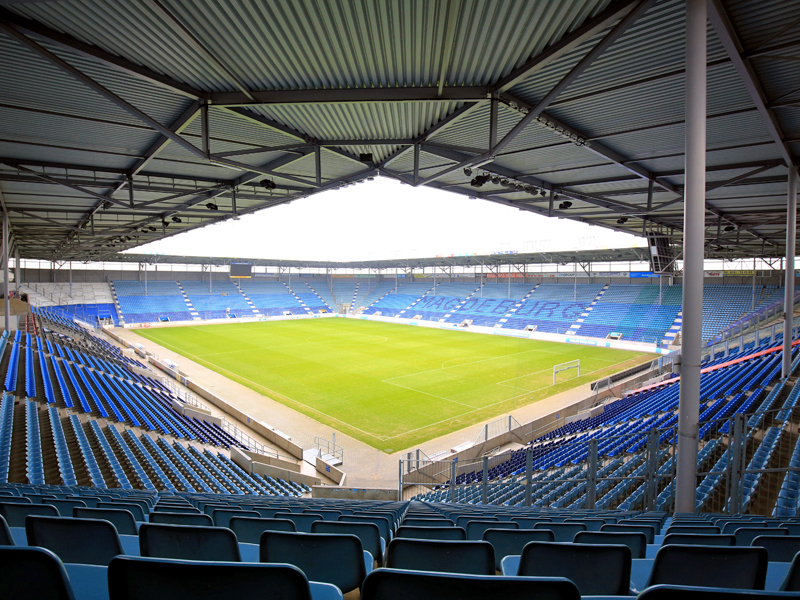 The MDCC Arena (still commonly referred to as Stadion Magdeburg) was built in 2006 and is in the east of Magdeburg on the east bank of the river Elbe around 1.5 miles from the city centre (30 minute walk) and 2 miles from the main train station (40 minute walk). The closest airport is Leipzig. Hanover or even Berlin could also be an option. Ryanair fly to Leipzig from Stansted. Find the cheapest price for flights to Leipzig using Skyscanner. Prices (at time of writing) are £222 going Thursday 19th, coming back Saturday night 22:20 (hand luggage only). City centre hotels include Hotel Ratswaage, City Hotel Magdeburg and InterCityHotel Magdeburg but there are hotels in Magdeburg city centre that cater for all price ranges. You can find more information on the Magdeburg English tourism website. There are two supermarkets (Aldi and Rewe) across the road (Friedrich-Ebert-Straße) from the stadium. Often in Germany, the pub comes outside; with fans buying beers at supermarkets and meeting up on the streets or in the parks with a few bottles (take a bottle opener). The nearest bar is Kelly’s Sportsbar at Berliner Chaussee 41, 39114. Pints are €3.30, chips are €3 and burger and chips start at €7.70. They are open 3 hours before kick-off. There is parking in the streets nearby the stadium and at Kelly’s Sportsbar. Tram: Tram line 6 goes from the main railway station or city centre in the direction of Herrenkrug. Get off at stop Berliner Chaussee / Arenen. The journey is less than 10 minutes. Check the public transport website although it is in German! 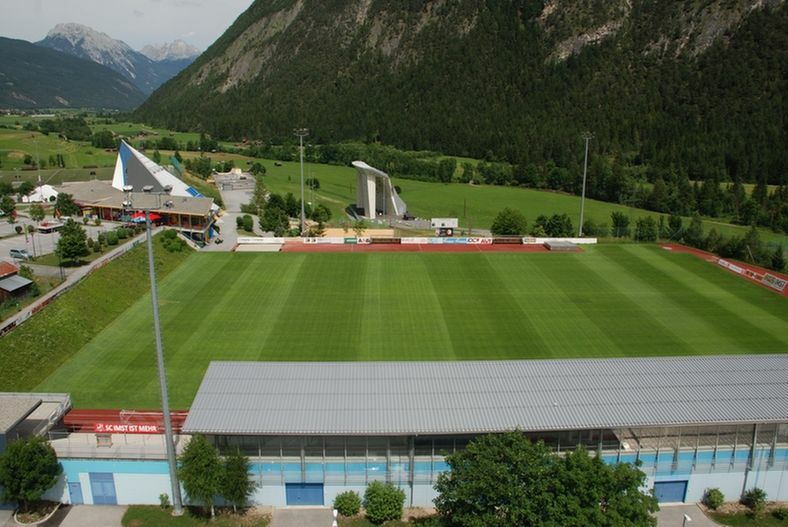 Stadion Jenbach is a 2,000 capacity stadium centrally located with some stunning views of the often snow capped mountains. Jenbach is a small town with a population of around 7,000. It is 18 miles from Innsbruck. Flybe go to Innsbruck from Bristol, Birmingham, Manchester, Leeds-Bradford and Edinburgh. Easyjet go from Gatwick and British Airways go from Heathrow. Find the cheapest price for flights to Innsbruck using Skyscanner. Some hotels in the town centre are Hotel Jenbacherhof, Landhaus Mayr and Camping Inntal (but it’s a hotel, not camping). Not far away is Lake Achensee. This is an alpine lake and very popular for water sports and swimming. Being an alpine lake the temperature can be described as bracing to say the least. There is also an English language tourism website for the Jenbach area. There’s the U30 bar at Schalserstraße 27 (1,227.02 km) 6200 Jenbach. Also a Chinese restaurant, Wu Han China Restaurant at Kirchgasse 9, Jenbach 6200 and Pizzeria Sandro at Schiessstandstrasse 6, Jenbach 6200. Jenbach is well served by the rail network. The rail website (in English) is http://www.oebb.at/en/. 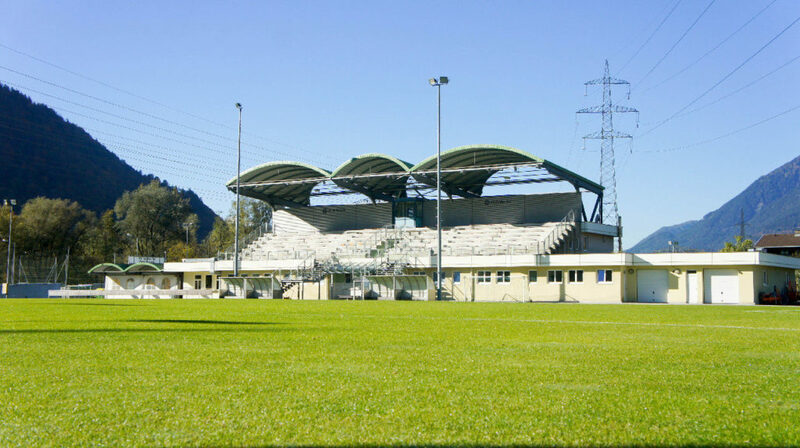 As you can see from the stadium picture above, the Velly Arena’s location is amazing. With rolling mountains right down to pitch level, you couldn’t ask for a more picturesque location. Entry is €12 and €8 for children and concessions. Imst is a town on the River Inn in western Tyrol, 31 miles west of Innsbruck and at an altitude of 2,717 feet above sea level. It has a population of around 10,000. The activities in Imst and very outdoor orientated with mountain biking, rock-climbing, horse riding and wake boarding available. Hotels in the town include Hotel Zum Hirschen, Hotel Eggerbräu, and Hotel Stern. There is an English language tourism website available. A few bars in Imst are Pool Hall Alex, Schustergasse 4, 6460 Imst also Downtown, Kramergasse 4, 6460 Imst and IT EIS PRA, Schustergasse 4, 6460 Gemeinde Imst. The stadium is very close to the town centre. Travel options are good into the town with train transportation along with Flixbus.